Many of the students have been preparing for lot of banking exams, government jobs, etc and so on. 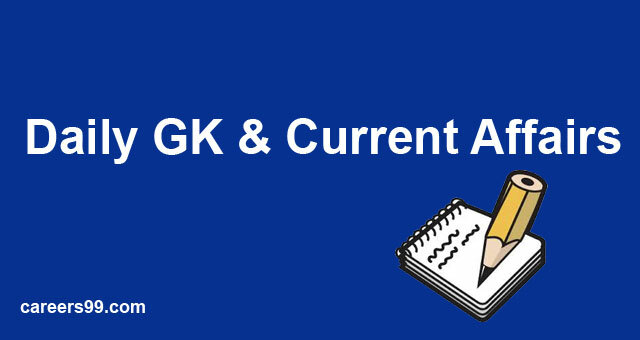 We suggested you that Daily GK Current Affairs of 30th August and current affairs quiz helps to improve your energy levels and lot of knowledge to boost up your preparation levels. Make sure to attempt all the questions which we have given in the current affairs on 30th august 2018 and check your preparation level. Mumbai, August 30: The Reserve Bank expects India’s economic growth rate to grow at 7.4 percent in the current financial year on pick up in industrial activity and a good monsoon. RBI released its annual report in Mumbai on Wednesday said due to the evolving economic conditions, real GDP growth for 2018-19 is expected to increase to 7.4 percent from 6.7 percent in the previous year. Indian Space Organisation to Outsource production of PSLVs and SSLVs to private industries. Actually the PSLVs stands for Polar Satellite Launch Vehicle and Small Satellite Launch Vehicles. K Sivan an Indian Space Chairman in Bangalore he informed to the media persons yesterday that the Private industries will lay a prominent role in Building Capacity. The Cabinet Committee on Economic Affairschaired by Prime Minister Narendra Modi gave its approval for implementation of an umbrella scheme ‘Ocean Services, Technology, Observations, Resources Modelling and Science (O-SMART)’. The CCEA approved the scheme for implementation during the period from 2017-18 to 2019-20 at an overall cost of Rs 1623 crore.The scheme covers a total of 16 sub-projects, which address ocean development activities such as services, technology, resources, observations and science. The Department of Biotechnology (DBT), Ministry of Science and Technology, and the International Energy Agency (IEA)signed an MoU on Enhancing Innovation for Clean Energy Transition. Google announced Project Navlekha at its 4th edition of Google for India Event held in New Delhi. Project Navlekha has been launched to enable Indian publishers of regional languages to publish their content online, without facing the trouble of selling printed copies. The 4th BIMSTEC Summit began in Kathmandu, Nepal.The two-day Summit will be held with the main focus on countering terrorism, enhancing regional connectivity and boosting trade. The theme of the summit is’Towards a peaceful, prosperous and sustainable Bay of Bengal region’. Prime Minister Narendra Modi will hold bilateral talks with leaders of BIMSTEC countries on the sidelines of the summit. 48 years old Arpinder Singh has won the Gold in Triple Jump at the Asian Games with an effort of 16.77m. Last India’s Gold Triple Jump in Men’s has came on 1970 from Mohinder Singh Gill. Arpinder, who has been without a medal in multi-sporting events since winning a bronze in the 2014 Commonwealth Games, produced his best jump of 16.77m in his third attempt. Swapna Barman has become the 1st Indian Hepathlete to won the Asian Games in Indonesia. She created a history in the Asian Games. She got gold medal in Asian Games for Hepathletes. Swapna Barman has 21 years old and logged 6026 score from the 7 events for 2 days. En route the title she won high jump (1003 Points) and javelin throw (872 points) the second best shot put with 707 points and long jump she scored 865 points.